Since 1991's debut Dawn Of Possession, the death metal veterans have been putting out nothing but consistently respectable material and this ninth album is no different. There isn't much I can't break down on the album because that is how lean and gimmick-free it is; no keyboards, no acoustics, no mind-blowing vocal shifts; just plain death metal. It does, however, have a very different approach to the genre that most practitioners have forgotten about; song-writing. There are very few blastbeats on the album, despite Steve Shalaty providing some fantastic footwork here. It never sounds predictable, and works wonders even when bound by an overprocessed drum sound (what the intention of such a mix is, I wouldn't know). Steve Shalaty's drumming is engaging and stands out particularly in 'Keep The Silence'. Robert Vigna takes up the title of riff lord, with his signature atonal riffs taking up centrestage yet again. The production for his guitars are exceptionally well-produced, overlaying subtle riffs over in your face riffs accentuated perfectly by the drums, the result is a multi-faceted sound at any point in the album. His style of using guitars rather than synthesizers and keyboards for atmosphere also lends the album a more convincing legitimacy. The result is a cold, mechanical sound that sounds brutal in its pursuit of clarity rather than the dirty underground swirl of a lo-fi mix most bands are using. Songs-wise, the album doesn't depart much from Majesty And Decay at all, which is by no means a problem at all. In fact, this album is logically the Part 2 of the former, with more muscle and less fat. 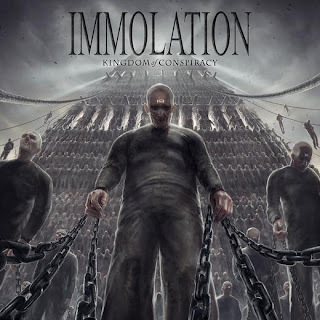 True, this makes for a dull listen when compared to many other bands pushing the boundaries, but Immolation weaves in enough tempo changes (and they happen on the dot here, without losing sense of musical direction) into the songs to keep every album a bit refreshing without compromising style. The mechanical nature of the production contrasts with the completely free form song structures here, giving the music some for of inhuman liveliness, in the form of building uneasy tension and dissipating them with aptly placed guitar solos that are frenetic and wild. As for the negatives, the album's main strength is also its possible weakness; as the album relies mostly and tempo changes and rhythms rather than melodies, this is sure to be a major turn off for casual listeners, even if they are self-confessed death metal fans. Also, because of the album's nature, it demands listening at proper situations, at night, or maybe during cold weather. As with black metal, the album seems dull and meaningless when listened to in broad daylight. Also, I may confess that I still prefer Majesty And Decay over this. The songs here are too concentrated and dense for casual listening, whilst Majesty And Decay made ample use of space and drone to ease tension between the off-kilter songs. As with Portal's offering earlier this year, Kingdom Of Conspiracy is too intense to the point that the album is an overkill. It has to be listened at sparing intervals. But maybe that was the point of these death metal veterans.